Recognized by more major businesses as the online compliance training resource. Quick, simple, and convenient online Food Handler course. Mobile and Desktop Friendly online training course and exam. Self-paced course - Follow your own schedule! Engaging and enjoyable, fully interactive training. This ANSI Accredited course meets the requirements for all local Texas jurisdictions and most US States. Our TX Food Handler Course is accredited by the TX Department of State Health Services and is valid statewide. Get started today! Same certificate course, but for Spanish speakers. Please click on View Package Details below for more information. If your job requires you to serve alcohol and food, 360training has created a special package for you. Register for TABC Certification + Texas Food Handler Certificate together for a discounted price. Need additional training? Take a look at our individual courses. This course is approved throughout the entire State of Texas. However, requirements, renewal periods and associated health department fees could vary depending on county/city. Please check with your local governing health department to obtain this information. this course is a basic review of food safety practices for food service employees. This course is recommended for all food industry employees. The Texas Department of State Health Services recognizes and has approved this Learn2Serve Food Handlers Course. All students must present their completion certificate to their local health authority andmust pay the required fees associated with registration at their local authority. COURSE FEES DO NOT COVER ANY LOCAL HEALTH DEPARTMENT FEES. Foodborne illness has been steadily rising in Texas and across the United States. In the interest of public health and safety, food handler certification is now mandatory to all food service employees in the state of Texas. Certification training covers basic food handling essential knowledge, safe temperatures, contamination hazards and proper handling techniques. 360training’s Texas Food Handlers course, which is approved by the Texas Department of State Health Services (DSHS) covers food safety issues, regulations and techniques necessary to maintain a safe dining environment. The two-hour online Food Handler Certificate course is so convenient you can take it anytime, anywhere with an internet connection. For less than $10, you can complete the necessary training and begin your new job in the food service industry. Why Should You Take Food Handler Training from 360training.com? 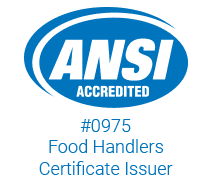 Food handlers in Texas cannot work without an approved Food Handler card. This requirement helps the state protect the public from foodborne illness by ensuring that food service employees know how to safely store and prepare food. A food-related illness outbreak is not only incredibly damaging to an establishment’s reputation, but can lead to long-term public health issues as well. How is a Food Handler Card Issued? This course is recognized and approved by the Texas Department of State Health Services. Steps to get your Food Handler Card? Print your Temporary Food Handler Completion Certificate (valid as proof of training and can be used to start working). What is a Food Handler Certificate? If you work at a restaurant or handle food in a food selling or serving establishment, you'll need a Food Handler Training course. The Learn2Serve.com Food Handler Training course will discuss various food safety handling and serving principles. Upon successful completion of the course and the exam, you will earn your food handler certificate of completion. The purpose and goal of the Learn2Serve Food Handler Training Certificate is to provide individuals working in restaurants and non–restaurant facilities with an overview of food safety issues, regulations, and techniques to maintain a food–safe environment. These individuals will also be able to better understand how handling food correctly reduces risks. This course covers food safety issues, regulations, and techniques to maintain a food–safe environment. It will help you to better understand how handling food correctly is required by law and how it improves safety and lowers cost as well. This training course is designed to prepare individuals in the Safe Handling of Food. This course is ANSI accredited and complies with ASTM e2659 standards. The course is recognized in most states and counties, but it is always best to check with your local authorities to be sure you complete any additional local registration, fees, or applications. Define food safety and its goals, benefits, impact, proper adherence, critical control points, and recall requirements. Recall biohazards, symptoms and causes of common foodborne illnesses, identify spoilage signs and causes. Identify three types of contamination, explain how food becomes hazardous, and recognize how to preserve food. Understand time, temperature, and control with relation to food handling and how to properly take the temperature of food and maintain the temperature while storing food. Discuss personal hygiene importance and practices, and food handling practices and techniques. Understand procedures for acquiring and receiving food, considerations for meat and poultry, and proper food storage. Identify both proper and improper cleaning and sanitizing procedures and implications. Identify signs and eradication procedures for pest infestation. In order to successfully obtain a Certificate for this course, you must effectively complete each lesson and pass the final exam at the end of the course. The lessons will cover material that ensure that the program learning outcomes are met. The course requires a minimum 90–minute participation time to be eligible to take the final exam. Our system will restrict access to the final exam until this time participation requirement is met. There will be a total of 45 questions covered in this final exam with a 70% passing score necessary for successful completion. The passing of the exam is necessary to have successfully completed the course and to earn your certificate. Should you fail the exam the first time, you will be given another attempt to pass the exam. A second exam failure will result in you having to retake the course before attempting the assessment again. The course content was developed by a former Senior Executive who had a long tenure at one of the world's largest publisher which also provides educational content and educational technology platforms. The content has been updated over time through the help of individuals who are currently employed in the Restaurant & Food Safety industry at Senior–Level Executive roles as well as those who are involved in the Higher Education industry. Upon successfully completing this course, your certificate will enable you to show proof of training to obtain further licensing if necessary. In many States, this certificate is not the actual Food Handler License, so you must always check with your local Health Department in charge of issuing these. What is Food Manager Certification? A Food Manager Certification is designed for mid-level or experienced professionals in the food service industry, such as restaurant managers, produce managers, c-store managers, etc. A Food Manager Certification is designed for mid-level or experienced professionals in the food service industry, such as restaurant managers, produce managers, c-store managers, etc. With the Food Manager Certification Exam there are no required courses or training requirements leading up to the exam (unless jurisdiction requirements stipulate otherwise). The learner is assessed based on their knowledge of a set of concepts. Upon successfully passing the exam, the learner will earn their Certified Food Protection Manager (CFPM) designation (or CFP). This acronym can be added to the individual's name. The certification is valid for a period of three to five years. At the end of the certification period, recertification will be required.